Way back I made an AnswerBot using Teensy. I mean not a real one. Basically its a button that you push, it will pick a random saying and send the keystrokes using Teensy Keyboard library. Always answerbot. 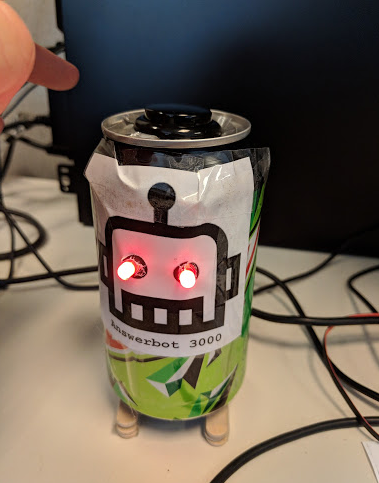 Anyway, I wanted to make a better physical representation of AnswerBot so here is Version 2.0. He of course has a short in one of the LEDs which is perfect. I need to work on my can cutting skills. Anywho AnswerBot is now online and adding fun quotes to my various instant message platforms. No way AnswerBot you cool.